What is a Reversing Entry? Reversing entries, or reversing journal entries, are journal entries made at the beginning of an accounting period to reverse or cancel out adjusting journal entries made at the end of the previous accounting period. This is the last step in the accounting cycle. Reversing entries are made because previous year accruals and prepayments will be paid off or used during the new year and no longer need to be recorded as liabilities and assets. These entries are optional depending on whether or not there are adjusting journal entries that need to be reversed. Why are Reversal Entries Used? Reversing entries are usually made to simplify bookkeeping in the new year. For example, if an accrued expense was recorded in the previous year, the bookkeeper or accountant can reverse this entry and account for the expense in the new year when it is paid. The reversing entry erases the prior year’s accrual and the bookkeeper doesn’t have to worry about it. If the bookkeeper doesn’t reverse this accrual enter, he must remember the amount of expense that was previously recorded in the prior year’s adjusting entry and only account for the new portion of the expenses incurred. He can’t record the entire expense when it is paid because some of it was already recorded. He would be double counting the expense. 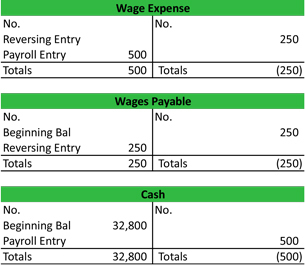 It might be helpful to look at the accounting for both situations to see how difficult bookkeeping can be without recording the reversing entries. Let’s look at let’s go back to your accounting cycle example of Paul’s Guitar Shop. 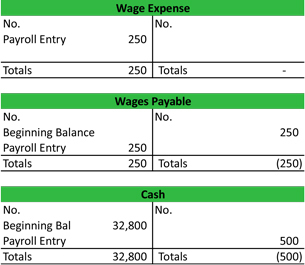 Paul can reverse this wages accrual entry by debiting the wages payable account and crediting the wages expense account. This effectively cancels out the previous entry. But wait, didn’t we zero out the wages expense account in last year’s closing entries? Yes, we did. This reversing entry actually puts a negative balance in the expense. You’ll see why in a second. On January 7th, Paul pays his employee $500 for the two week pay period. Paul can then record the payment by debiting the wages expense account for $500 and crediting the cash account for the same amount. Since the expense account had a negative balance of $250 in it from our reversing entry, the $500 payment entry will bring the balance up to positive $250– in other words, the half of the wages that were incurred in January. See how easy that is? Once the reversing entry is made, you can simply record the payment entry just like any other payment entry. If Paul does not reverse last year’s accrual, he must keep track of the adjusting journal entry when it comes time to make his payments. Since half of the wages were expensed in December, Paul should only expense half of them in January. On January 7th, Paul pays his employee $500 for the two week pay period. He would debit wages expense for $250, debit wages payable for $250, and credit cash for $500. The net effect of both journal entries have the same overall effect. Cash is decreased by $250. Wages payable is zeroed out and wages expense is increased by $250. Making the reversing entry at the beginning of the period just allows the accountant to forget about the adjusting journal entries made in the prior year and go on accounting for the current year like normal. As you can see from the T-Accounts above, both accounting method result in the same balances. The left set of T-Accounts are the accounting entries made with the reversing entry and the right T-Accounts are the entries made without the reversing entry. Recording reversing entries is the final step in the accounting cycle. After these entries are made, the accountant can start the cycle over again with recording journal entries. This cycle repeats in the exact same format throughout the current year. 1 What is a Reversing Entry? 2 Why are Reversal Entries Used?